There has not been a show during which Mr. Plaskett has disappointed me. Miklos felt bad for me after we missed the June show at Brock because I was working in a pee-pee soaked heckhole so he got these tickets as soon as I found out they were on sale. We’d been looking forward to it all summer. So when we realized it was actually October 19th this past week, we got ourselves psyched, headed to Hamilton, Ontario, and got slightly lost in a parking garage and eventually found our way to the show. What a great time. I merged two songs into one video by accident which I’m sure is Youtube faux-pas. Sorry, internet! Apologies for the heads in the way too. 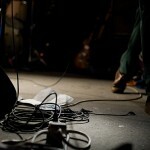 Share the post "Joel Plaskett Show"
Tagged good, live, music, plaskett, video.